Suction Cup Packet of (4) 56mm (2 1/5″) side pilot hole with 6.5mm side hole suction cup, cups, sucker, suckers, clear vinyl PVC. 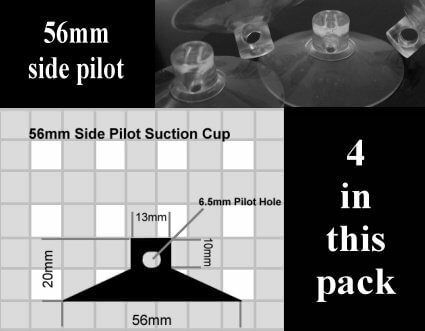 Packet of (4) 56mm Side Pilot Hole Cups. Ideal for a host of tasks both around the home and in the office. This larger sized suction cup is ideal for attaching strings, wires etc through the 6.5mm side pilot hole. Adheres to glass, mirrors and other non-porous surfaces. Various quantities and sizes available, check out our other listings for more info. FREE samples delivery to worldwide.